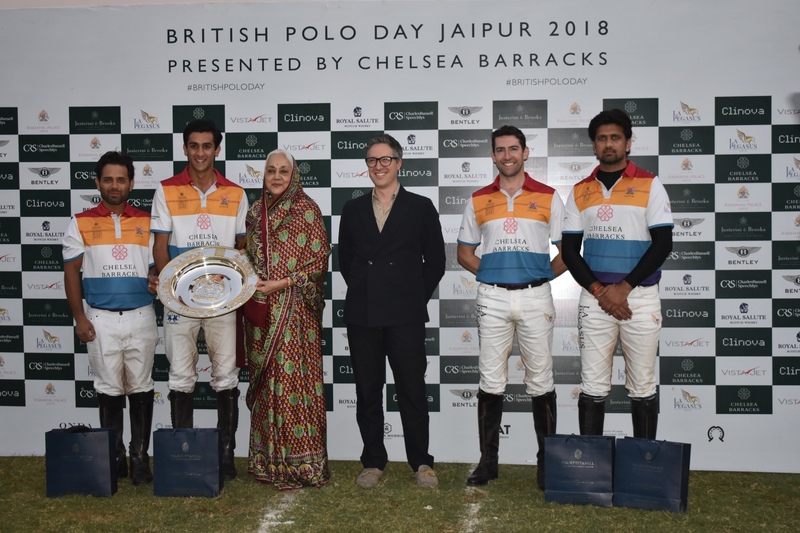 The 4th edition of British Polo Day was celebrated on Sunday with 2 exciting matches at the Rajasthan Polo Club ground in Jaipur. The first match was played between Royal Salute BPD II team and Bentley Rajasthan Polo team. In the first match Royal Salute BPD IIwon against Bentley Rajasthan Polo 7 goals to 4 goals. The second match was between Vistajet BPD I and Chelsea Barracks Jaipur team. The Chelsea Barracks won the match with 6 goals. From the winning team HH Maharaja Sawai Padmanabh Singh of Jaipur scored 4 goals while Ashwani Sharma scored 2 goals. Vistajet BPD I team could scored 4 goals. There were also an equestrian display by the 61 cavalry riders. The prizes were given away by the Chief Guest, Rajmata Padmini Devi of Jaipur.